……………………………………………………………………………………………………………………………. 7:00 a.m. – 10:00 a.m.
Fishing/Weigh-in ……………………………………………………………………………………………………………….. 7:00 a.m. – 11:00 a.m.
Activities……………………………………………………………………………………………………………………………………. 9:00 a.m. – 11:30 a.m. Lunch …………………………………………………………………………………………………………………………………………. 10:00 a.m. – 12:00 p.m. Awards Ceremony and Giveaways …………………………………………………………………………. 11:30 a.m. Fishing equipment is not provided at this event; bring your own gear, bait and cooler. Must abide by current state laws and regulations. All anglers age 16 and older must possess a valid Louisiana recreational fishing license. HONOR SYSTEM – all fish entered must be caught by that participant. One “Angler” award per participant; winners must be present to receive prizes. All youth 15 and under must be accompanied by a parent/guardian at all times. All fish must be caught from shore. Each fish may only be entered in ONE category or division. Each registered participant will be entered into a raffle drawing. Winners will be announced at the awards ceremony and must be present to claim their prize. The first 100 youth registrants that attend will receive a fishing goody bag. 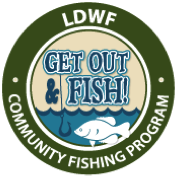 LDWF Mobile Touch Tank, fish identification, fish prints, casting instruction, and more! DON’T FORGET YOUR COOLER TO KEEP WHAT YOU CATCH!